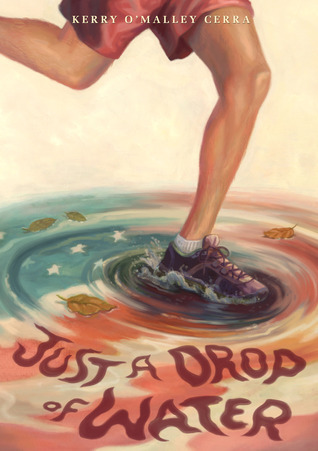 As a member of the Fearless Fiteeners, I was able to read an ARC of Kerry O’Malley Cerra’s middle grade novel, Just a Drop of Water (9/2/2014/Sky Pony Press). ARCs (Advanced Reader Copies) are the uncorrected proofs that are sent to reviewers, librarians, and book bloggers to promote the book. My fellow fifteeners and 2k15 classmates are sending their ARCs on tour, which allows us a sneak peek at these upcoming new releases. I’ve decided to let you all know about the ARCs I’m reading to help support my 2015 debut colleagues. These are introductions, not reviews, just to let you know what’s coming out in the next year. Here’s the description: Ever since he was little, Jake Green has longed to be a soldier and a hero like his grandpa, who died serving his country. Right now, though, he just wants to outsmart—and outrun—the rival cross country team, the Palmetto Bugs. But then the tragedy of September 11 happens. It’s quickly discovered that one of the hijackers lived nearby, making Jake’s Florida town an FBI hot spot. Two days later, the tragedy becomes even more personal when Jake’s best friend, Sam Madina, is pummeled for being an Arab Muslim by their bully classmate, Bobby. About the author: Kerry O’Malley Cerra is a former high school history teacher who often enhanced textbooks with historical fiction to bring time periods to life. Just a Drop of Water was inspired by a deeply personal experience following the tragic events of September 11, 2001. Though she’ll always consider Philly her home, she currently lives in Florida with her husband, kids, and three poorly behaved dogs. You can find her on Goodreads and Twitter.